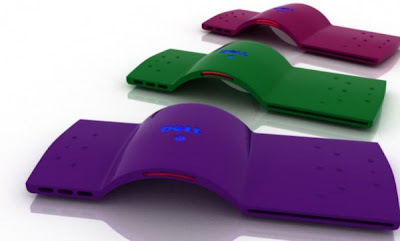 An industrial designer named Pauline Carlos has created an interesting concept for Dell. The concept is called the Froot. The Froot is a new type of computer that is composed of two projectors that eliminate the need for a traditional monitor or USB keyboard. The Froot’s projectors display the image of the monitor on the wall and will project a keyboard on a table or surface for typing. The only thing that a person will need to properly run their computer is a blank wall and empty desk. Ports are placed on the left hand side of the Froot and the right side of the device features a DVD drive. The Froot could be beneficial to the environment. The use of a virtual monitor and keyboard could eliminate much of the material that goes into creating computers. In essence, the Froot is more than a concept; it’s an idea that caters to sustainability. This means that there will be less junk and trash in landfills. To create the Froot, Pauline used a biodegradable case where the two projectors are housed. The only thing that the Froot is missing is a mouse. The mouse issue probably won’t be solved with a third projector.